What Can You do about Stretch Marks in Pregnancy? Many changes occur after a female gets pregnant. Her body undergoes various physical changes, one of which is pregnancy stretch marks. Fortunately, the occurrence of stretch marks can be prevented and their appearance can be reduced by taking proper measures early during your pregnancy. Learn the various lifestyle changes and skin care routine you need to follow. Stretch marks occur when the growth of belly stretches your skin. This results in the breakage of the elastic fibers beneath the skin surface, leading to appearance of stretch marks. Your belly and breasts are the most common regions where you will get the stretch marks while you are pregnant. They may also appear on your thighs, buttocks and upper arms. These marks begin as pink, reddish, dark brown or purple marks depending on the color of your skin and after pregnancy gradually fade to white or gray. Foods rich in antioxidants-these include fruits and vegetables such as spinach, blueberries and strawberries. Foods rich in Vitamin E, which helps in protecting the membranes of the cells. Such foods are broccoli, collard greens, nuts, seeds and avocados. Foods containing vitamin A such as sweet potatoes, red bell peppers, mango, carrots and squash. However, take care to not consume more than the recommended daily amount of 10,000 IU or 3,000 mcg (in females older than 18 years). Foods rich in omega-6 and 3 such as oysters, walnuts, fish, fish oil and eggs. Consume herbal tea (without caffeine). Eat fruits and vegetables that have high water content to remain adequately hydrated. You can eat celery, cucumbers, honeydew, bell peppers, watermelon and strawberries. Perform low impact exercises: Doing exercise helps in retaining the elasticity of your skin by improving blood circulation. Do exercises specific for pregnancy such as stretches, kegel exercises etc. Do yoga, Pilates and other low impact exercises. Keep cravings at bay by eating a little amount of food for which you have a craving and eat a large serving of fruits with that. Do dry brushing: Brushing your skin utilizing a dry brush helps in exfoliating your skin to keep it healthy. 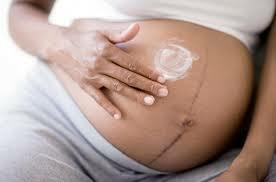 Dry brushing is also advised to reduce the appearance of stretch marks and to prevent the occurrence of stretch marks. Use dry brush made with natural fibers that have stiff bristles. Brush legs to heart area. Focus on regions where there are stretch marks such as stomach and abdomen. Once you have brushed your body, bathe in lukewarm water to remove the dead skin cells. Avoid using dry brush on the breasts as skin of breasts is sensitive and may get damaged on brushing. Avoid using chemicals: Sulfates is present in certain body washes, which may dry your skin out and reduce elasticity. Use skin cleansing agents that have natural oils. Apply natural oil on your skin: Natural oils help in moisturizing and hydrating your skin. You should apply them on the legs, lower back, thighs, belly, and sides. Some of the popular natural oils that you can use during pregnancy are shea butter, bio oil, wheat germ oil, cocoa butter, pure lanolin oil and bio oil. Shea butter has Vitamins E and A which help in improving the skin elasticity and preventing dryness. You should apply the oil after taking bath every morning and at night. Apply sunscreen: In case you go swimming or go out in sun, ensure to apply sunscreen on your body, particularly on areas where stretch marks may appear such as belly, sides and chest and any other areas which will be exposed to sun’s rays. Take a leaf of aloe Vera, cut it and extract gel from it. Apply the gel to the stretch marks. Massage till it gets absorbed in the skin. Use it two times a day. Gel of Aloe Vera helps in promoting healing of skin and visible results are seen within few days. It also helps in soothing the skin and in keeping it hydrated. Massage with petroleum jelly on your stretch marks for 6-10 minutes. Do every night before sleeping. Petroleum jelly helps in locking the moisture in skin; thereby, healing stretched and dry skin. Use glycolic acid cream on stretch marks as recommended/advised on the label of the box. Apply one or two times per day. Glycolic acid increases the production of collagen in skin, which helps in increasing the skin elasticity; thereby, preventing stretch marks appearance post pregnancy. You can purchase glycolic acid cream from local pharmacies. But, you should consult your physician before using glycolic acid. Take egg whites of 1-2 eggs. Beat them lightly. Apply them using a pastry brush on stretch marks. Let it air dry. Rinse using cool water. Apply a moisturizer. You may add a few drops of almond or coconut oil to egg white for additional benefits. You can apply egg whites daily to the stretch marks. The enzymes present in egg whites help in increasing the elasticity of skin, thereby, fading the stretch marks over time. Mix 2 tbsp of coconut or olive oil with ½ cup of coffee beans (ground). Apply this mixture on the stretch marks as a scrub. Massage in circular motion gently. Leave for 5 minutes. Rinse with lukewarm water. Use this two-three times in a week. Caffeine present in coffee penetrates the skin and revitalizes cells of skin by stimulating blood circulation. This and olive oil provides nourishment to the skin and heals the stretch marks. Dilute one cup ACV in ½-1 cup of water. Put the diluted ACV in a spray bottle and spray it over your stretch marks. Let it air dry. You can also leave it overnight. Take a shower in the morning. Apply a moisturizer. Repeat every night. ACV is great for healing blemishes and scars. It helps in lightening the stretch marks. Now you know all about pregnancy stretch marks. What's Cervical Mucus Like Before Your Period? Is It Ok to Do Weight Training While Pregnant? After How Long Can Pregnancy Be Detected?